Like Connie, Sarah is a ‘born musician’ who transmits something very special to any audience, no matter whether she is playing the cello or the accordion. Employed by a number of exciting travelling theatre companies, she lugs one or both of these big instruments from town to town, from theatre to theatre, from stage to stage, inspiring actors and audiences with her extraordinary musicianship. Sarah’s demanding life-style was not helped by the pain that kept reccurring in her left arm. When she consulted a doctor she was told she needed to do exercises in order to strengthen her stomach muscles so as to cope better with the big instruments. 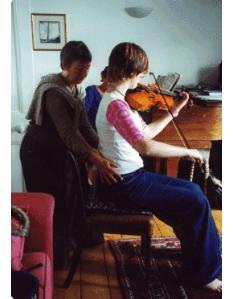 In May 2004 Sarah arrived for a Functional Integration lesson – accompanied by her two instruments, which she played at the beginning and at the end of the session. During that lesson we worked on becoming aware of the stability-and-mobility of her central axis, the sensation of feeling properly grounded, both in sitting and standing, and most importantly on giving herself permission to move a little with her instrument instead of keeping her body immobile as she had been told by teachers. We were both surprised how much the musical sounds coming from both instruments at the end of the session were singing and soaring. Sarah felt a sense of dancing as she had seen in Jacqueline Du Pré. “I notice that everything is much more relaxed when I’m playing. (I was very tense before.) The bow is much more fluid and I move with my cello. When I learned to play the cello I was told not to move ... It was all a kind of fear, which affected my left shoulder. My left shoulder was always very, very tense”. “It improved one hundred percent! I mean I have to work on my technique, but that’s a different thing. That’s a scientific thing. ... I suddenly became aware of how much this leg was off-centre and how I was very biased towards one side. You know I always carry my cello on my left shoulder; falling in skiing this winter was always on the same side. I could feel that my body was reacting completely differently through the different sides. It’s still there but it has started changing. My awareness of this has become much greater – like falling over in skiing, I would never have noticed that I was always falling over on the same side. I mean awareness is half of it. I realize, for instance, that I shouldn’t always carry the cello on the left; I should have it more balanced; I should try doing things that feel slightly strange. Being told by your own body that it’s out of line is actually a big revelation. My hands are so relaxed that they hardly feel I am playing now. There isn’t so much pressure on them because I feel more relaxed. The left hand feels able to fly more without me having to think about every note. This shoulder, which is normally tense, is back and my arm is very relaxed and low. That’s why my fingers are freer. And the bow hand is not so tense on the back. Everything is sort of dancing with the music”. “I always knew that if I thought about everything I would get it wrong. And it still happens sometime that I go into a state where I am actually playing so much worse than I need to. Also I really realised that if you get taught something badly or you learn it in an anxious state or wrongly, - and this is with anything, back from school you know - it stays with you, the remnants of that stay with you. Thinking about the cello, I learnt certain positions under stress; I thought they were difficult; so they always have been difficult even when they don’t need to be difficult. If you have an anxiousness about expressing, your nervous system remembers that”. “Last weekend I played four hours in my room – all the sonatas I knew – and could have gone on for ever... It’s only after I stopped playing (to have something to eat) that I realized I hadn’t ached at all. I just felt a little exhausted, but nicely so. In fact there hasn’t been any pain in my shoulder for several weeks. I think something has changed in my leg too. There is no more pain in my knee,, but that needs a little more work because now I feel some strain on the top of my foot”. Moshe Feldenkrais used to say that we need to learn how to shed “all that junk and rubbish put into us by people who had the best of intentions”. Sarah is doing just that, mainly by giving herself permission to be playful, make mistakes, and let her body become her primary instrument. She begins to realize ever more clearly that then, and only then, can the music come from deep inside, be really authentic, and make everything dance: herself, the instrument (as an extension of her own body), and the listeners.